The phytotoxic influences of Alnus nepalensis, Artocarpus heterophyllus and Emblica officinalis were tested by growing test crops of Oryza sativa, Phaseolus vulgaris and Pisum sativum for bioassay culture. The germination of Oryza sativa was stimulated in Alnus nepalensis whereas, Pisum sativum was restrained in all the tree crops. However, Phaseolus vulgaris was found most resistant crops for all trees aqueous extract. The radicle growth of all the food crops depressed significantly (P>0.05, P>0.01) in aqueous extract of all the tree crops. Allelochemicals refer mostly to the secondary metabolites produced by plants and are by-products of primary metabolic processes (Levin, 1976). They have allelopathic effect on the growth and development of the same plant or neighboring plants. Allelochemicals most often impart plant resistance to insects, nematodes and pathogens. There release into environment, some may regulate the distribution and vigor of plants. Usually plants came in contact with the allelochemicals in soil and their effect on crop plants may be modified by soil moisture, soil temperature and other soil factors (Patrick and Koch, 1958; Einhelling and Eckrich, 1984). The effects of secondary substances released by these mechanisms can be long lasting (Patric, 1971) or quite transitory (Kimber, 1973) and can ultimately influence practices like fertility, seeding and crop rotations. The allelopathic effects are selective (Stowe, 1979; Melkania, 1983) and vary with different trees since these plants will vary in the amount of indigenous secondary metabolites and would release different amounts of the phytotoxins. Generally leaves are the most potent source of allelochemicals, however, the toxic metabolites are also distributed in all other plant parts in various concentration. The secondary compound released from litter or formed by microbes decomposing the litter will be influenced by the type of crop being leached or decomposed (Putnum and Duke, 1978). In fact, litter leaching and decay are the major pathways of the release of allelochemes form plants. Harborne (1977) proved that higher plants (tree crops) release some phytotoxins into soil, which adversely affect the germination and yield of crops. Such type of tree crop interactions called phytochemical ecology/ecological biochemistry. In the traditional agroforestry system of country people are growing several tree species in or around the agricultural fields. However, although recent attempts have been made to use available land more efficiently, agricultural losses are being experienced by marginal and sub-marginal farmers, who are concerned about the adverse effect of farm trees on cultivated land and standing crops (Bhatt et al, 1993). Due to the adverse effect of trees most of the farmer are now neglecting to grow the tree species in agricultural field because, to grow food crop is essential for subsistence. Therefore the planting of tree crops has not been practiced on large scale. In agroforestry importance of multipurpose tree species cannot be overlooked as they provide food, fodder, fuelwood and social security to the growers. Some species improve the soil but at the same time some species may cause adverse effect on long-term basis (Gill, 1992; Mughal, 2000). In the agroforestry systems of Mizoram number of principle trees (Alnus nepalensis, Artocarpus heterophyllus, Emblica officinalis, Aporosa octandra, Anthocephalus chinensis, Albizzia procera, Melia azadirchta Bauhinia variegate, Erythrina indica, Gmelina arborea etc.) and agricultural crops (Oryza sativa, Phaseolus vulgaris, Pisum sativum, Glycine max, Brassica campestris, Zea mays, Cajanus cajan, Vigna sinensis etc.) are grown. Production of agricultural crops is the main sources of subsistence in Mizoram, because 80% population of this region dependant upon agriculture. Combining of trees, crops and livestock is in practice since long and getting benefits on sustained basis. In Mizoram under managed agroforestry system the farmers in several combinations frequently grow trees and crops. Keeping in view the above introductory background and stimulatory and inhibitory effects of trees on crops, in the present study an attempt has been made to analyses the phytotoxic effects of multipurpose agroforestry trees (Alnus nepalensis, Artocarpus heterophyllus and Emblica officinalis) on the germination and radicle growth of test crops (Oryza sativa, Phaseolus vulgaris and Pisum sativum) of this region. Therefore, to examine the allelopathic influences of trees on crops the following experiment was conducted for bioassay culture in laboratory. In bioassay studies, mature leaves were collected from natural growing trees of selected tree species. The leaves were sun-dried and ground separately in a mechanical grinder. A sample of 1 and 2 gm (for 1% and 2% concentration) of each component was weighed and added to 100 ml of double distilled water and kept for 24 hours at room temperature. The resulting brownish and dark extractions were filtered through three layers of whatman no.1 filter paper and stored in the dark place in conical flasks until required. The effects of aqueous extract on seed germination and radicle length were tested by placing 10 seeds of each test crop in Petri dishes (five replicates) containing three layers of whatman no.1 filter paper saturated with the leachate. A separate control series was set up using doubled distilled water. Moisture in the Petri dishes was maintained by adding about 1 ml of aqueous extract or doubled distilled water as required. The number of seeds germinated was counted everyday for 7 days after which the observations were stopped. The allelopathic effects of leaf aqueous extract (1% and 2% concentration) of Alnus nepalensis, Artocarpus heterophyllus and Emblica officinalis tested on test crops Oryza sativa, Phaseolus vulgaris and Pisum sativum and compared with control. The observations have been presented in Table-1 (germination percentages) and 2, 3, and 4 (radicle length). The percentage germination of Oryza sativa in 1% and 2% aqueous extract of Alnus nepalensis were stimulated 2.13% and 4.25% respectively, the germination values were 96% and 98% in 1% and 2% aqueous extract respectively. The germination of Oryza sativa depressed 4.25% (Artocarpus heterophyllus) and 10.64 % (Emblica officinalis) in 2% aqueous extract. 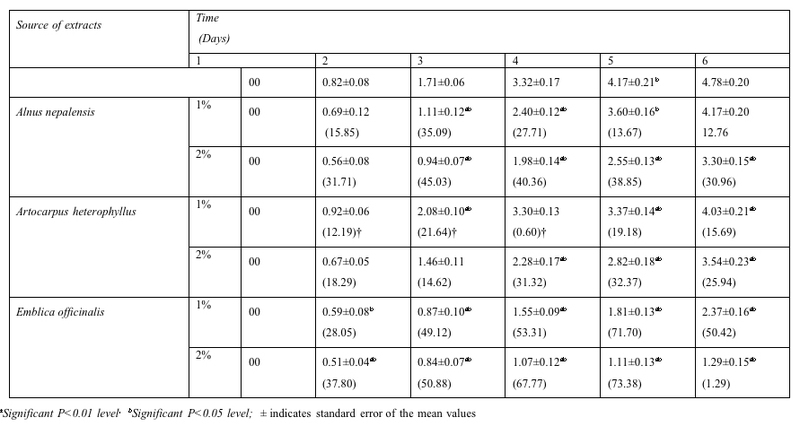 However, the germination was inhibited 1.06% in 1% aqueous extract of Artocarpus heterophyllus and did not show toxic effect in 1% aqueous extract of Emblica officinalis compared with control (Table 1). Similarly, Phaseolus vulgaris was also grown under same tree species and no toxic effect was found in 1% aqueous extract of Alnus nepalensis and 1% and 2% aqueous extract of Artocarpus heterophyllus (Table 1). Only the germination reduced 4.0% in 2% aqueous extract of Alnus nepalensis and 1% and 2% aqueous extract of Emblica officinalis. Pisum sativum showed that there was high adverse impact of various tree components on percent germination in 1% and 2% aqueous extracts. The percent germination of Pisum sativum was 34%, 52% and 66% in 1% aqueous extract of Alnus nepalensis, Artocarpus heterophyllus and Emblica officinalis while, in 2% it was 10 % 48% and 46% under same species respectively. The maximum reduction (74.42%) (Irrespective of percent concentration) was observed to Alnus nepalensis and minimum (34.88%) was in Emblica officinalis. The Germination of Phaseolus vulgaris (irrespective trees and percent concentration), was found most toxic followed by Oryza sativa and Pisum sativum was the most sensitive crop for these tree species. For radicle length each test crop was also tested under same trees and control. The radicle length of Oryza sativa was measured and compared with that of control for six days (Table 2). In first day no radicle growth of Oryza sativa was recorded under all the treatments of Alnus nepalensis, Artocarpus heterophyllus and Emblica officinalis. Onward second day, the radicle growth was produced under all the treatments. Among the tree species and percent concentration, in sixth day the maximum reduction in radicle length of Oryza sativa reduced significantly (P<0.05, P<0.01) in 2% aqueous extract of Emblica officinalis as 1.29±0.15 cm. The value of radicle length in aqueous extract of Artocarpus heterphyllus and Alnus nepalensis were 4.03±0.21 cm and 3.54±0.23 cm; 4.71±0.20 cm and 3.30±0.15 cm for 1% and 2 % aqueous extracts respectively (Table 2). Thus, the radicle length of Oryza sativa restrain significantly (P<0.05, P<0.01) in all the aqueous extract of trees compared with control value (4.78±0.20 cm). The radicle length of Phaseolus vulgaris in 1% and 2% aqueous extract of Artocarpus heterophyllus and 2% aqueous extract of Emblica officinalis for first day reduced completely (100%). All the radicle length was observed in increasing order onward second day (Table-3). The radicle length of Phaseolus vulgaris was depressed significantly (P<0.05, P<0.01) in aqueous extract of Alnus nepalensis 1% (7.88±0.27 cm) and 2% (7.21±0.32 cm), Emblica officinalis 1% (8.93±0.63 cm) and 2% (6.92±0.32 cm) and Artocarpus heterophyllus 1% (8.78±0.55) and 2% (8.52±0.21), compared with control (9.99±0.56 cm). 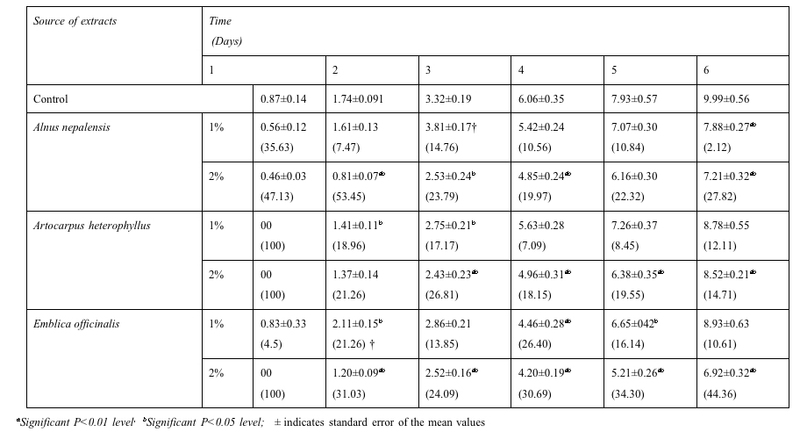 Table 3: Effect of aqueous extracts of tree species on radicle length (cm) of Phaseolus vulgaris at 7 days after sowing (The data in the parenthesis indicate % inhibition/stimulation† over control). Pisum sativum was also tested for aqueous extract in different tree species and none of the seed produced radicle growth for first and second day (Table 4). In third day except 2% concentration of Alnus nepalensis and Artocarpus heterophyllus, other treatments exhibited radicle growth. In sixth day the radicle length of Pisum sativum was reduced significantly (P<0.05, P<0.01) compared with control. The maximum and minimum radicle length of Pisum sativum in aqueous extract of Alnus nepalensis was 2.66±0.44 cm and 2.64±0.23 cm for 1% and 2 % aqueous extract respectively. Similarly other values of radicle length decreased with increasing aqueous concentration as 2.25±0.22 and 1.57±0.18 for 1% and 2% of Artocarpus heterophyllus and 2.65±0.30 and 2.31±0.26 for Emblica officinalis (Table 4). In the crop fields, at any given time there are at least more than one plant species growing together. In crop mixture or inter cropping systems, the major plant species are crops, besides, some weeds may also be presented. When the two plant species grow together they interact with each other either inhibiting or stimulating their growth or yield through direct or indirect allelopathic interaction. Among the studies conducted for several species, Baker (1966) reported the Eucalyptus globulus produces volatile emanations that inhibit root growth of Cucumis species seedlings and also the growth of hypocotyls, but not the roots of Eucalyptus seedlings. Singh and Bawa (1982) found leaf leachates of Eucalyptus globulus to be inhibitory to seed germination of Glaucium flavus. Many other species also reported for allelopathic to plant growth are Celtis laevigata, Rhododendron albiflorum, Grevillea robusta, Quercus falcata, Quercus alba (Rice, 1974, 1979), Pinus roxburghii, Cedrus deodara, Quercus leucotrichophora, Myrica esculenta (Melkania, 1983). Various workers have been reported allelopathic influences on certain tree crops (Saxena and Singh, 1987; Melkania, 1984; Suresh and Vinaya Rai, 1987; Bhatt and Todaria, 1990) for the different parts of the country. Kaletha et al (1996) also done the similar study for aqueous extract of leaves and bark of Grewia oppositifolia, Ficus roxburghii, Bauhinia variegata and Kydia calycina on test crops Echinochloa frumentacea, Eleusine coracana, Zea mays, Vigna unguiculata, and Glycine max and found that the bark and leaf aqueous extracts of tree species were most toxic to food crops. Similarly Bhatt and Chauhan (2000) found allelopathic influenced of Quercus species on Triticum aestivum, Brassica campestris and Lens culinaria and found leaf and bark extract suppressed the germination, plumule and radicle length of all food crops. As literature revealed that numerous plant species released organic compounds in the soil. Although these toxic substance may be useful to control weed, insect nematodes and disease pathogens. Therefore, some preventing measures should be taken to minimize the deleterious effects for plants especially as the earlier finding given by some workers as water drainage specially for Oryza sativa field which release phytotoxic substances out from poorly drained soil and increase soil productivity. Crop-rotation in monoculture soil sickness often occur due to imbalance of soil micro-organism leads accumulation of soil toxins mineral deficiency or abnormal soil pH which reduced soil productivity. Some time application of nutrient also found suitable to reduced phytotoxic effect. Besides that the tree species provides harmful effects especially leaves, should be lopped, at the time of growing crops which will reduced the toxic effects from the place. Bhatt BP & NP Todaria. 1990. Studies on the allelopathic effects of some agroforestry tree crops of Garhwal Himalaya. Agroforestry System 12: 251-255. Bhatt, BP, DS Chauhan & NP Todaria. 1993. Phytotoxic effects of tree crops on germination and radicle extension of some food crops. Tropical Science 33: 69-73. Harborne, JB. 1977. Introduction to Ecological Biochemistry. Academic Press, New York. Kaletha, MS, BP Bhatt & NP Todaria. 1996. Tree-crop interaction in traditional agroforestry systems of Garhwal Himalaya. 1. Phytotoxic effects of farm trees on food crops. Allelopathy Journal 3(2): 247-250. Kimber, RWL. 1973. Phytotoxicities form plant residues. I. The influence of rotted wheat straw on seedling growth. Aust. J. Agric. Res. 18: 361-374. Melkania, NP. 1986. Allelopathy and its significance on production of agroforestry plants association. Proceeding workshop of Agroforestry for Rural Needs. Feb.22-26, 1986, New Delhi. ISTS, Solan, pp. 211-224. Saxena, S & JS Singh. 1987. Influence of leave leachates from Eucalyptus globulus and Aesculus indica on the growth of Vigna radiata and Lolium perenne. Indian Journal of Ecology 5: 148-158. Stowe, LG. 1979. Allelopathy and its influence on the distribution of plants in an Illinois old field. Journal of Ecology 67: 1065-1085. Suresh, KK & RS Vinaya Rai. 1987. Studies on the allelopathic effects of some agroforestry tree crops. The International Tree Crops Journal 4: 109-115.